With environmental champions now a majority in the House of Representatives, a new, greener Congress is now in session, and we must make sure climate action is its top priority. Urge your senators and representative to use their power to protect our air, water, and lands from President Trump’s attacks, expand our clean energy economy, and avert climate catastrophe — or risk being left behind on the wrong side of history. 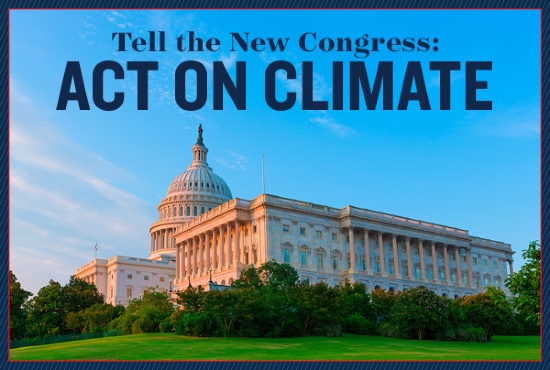 A new, greener Congress is now in session, and we must make sure climate action is their top priority. This is a new day for climate action. As your constituent, I am deeply concerned about the growing scientific evidence of the worsening impacts of climate change and the Trump administration's refusal to act. We are looking to you to end our dependence on dirty fossil fuels, expand our clean energy economy and create jobs, and avert climate catastrophe. I urge you to use your congressional power to make climate a top priority and help put America on the path to: * Promote a just and equitable transition away from dirty fossil fuels and toward a 100% clean energy future * Invest in building a clean energy economy, reducing emissions, creating green jobs, and upgrading America's infrastructure to withstand the worsening impacts of climate change * Fulfill our commitments under the Paris agreement to reduce dangerous carbon pollution * Hold President Trump and his administration accountable to enforcing important climate and pollution policies like the Clean Power Plan, to slash carbon pollution from power plants; Clean Car Standards, to reduce emissions from cars and trucks and save consumers money at the pump; and the Methane Rule, to reduce emissions from oil and gas drilling * Fully fund the Environmental Protection Agency, Department of the Interior, Department of Energy, and other key federal agencies tasked with defending our environment and health Climate change has dire impacts on nearly all aspects of our lives -- our economy, agriculture, energy, infrastructure, health, and more. If we're going to build a better, cleaner, and safer America, we MUST address the climate crisis. Lawmakers who continue to deny climate change are on the wrong side of public opinion, science, and history. Please act in the best interest of constituents like me -- and all Americans -- and do everything you can to support these critical goals. Our planet and our future depend on it.